Good ‘lawd…..do I love me some potatoes. And in fact, my last meal that I request could possibly be a mountain of Mickey D french fries that is then washed down with a lovely bottle of vino. 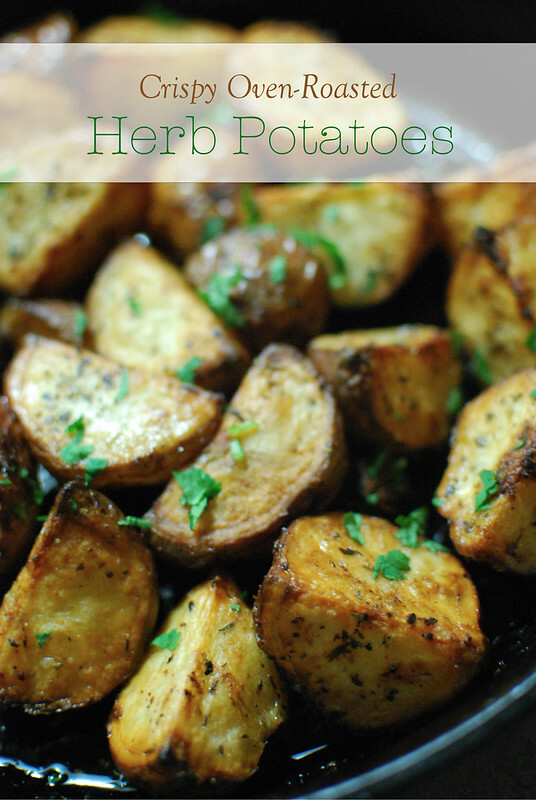 So naturally, I’m obsessed with these easy, crispy, oven-roasted herb potatoes. They can be prepped in under 5 minutes and since they’re roasted in a hot cast iron skillet, they are wonderfully crispy on the outside and tender on the inside. These little beauties are quite versatile as well. Perfect side dish for a brunch….low maintenance for a weeknight dinner….and fantastically delish to adorn your table for any special occasion/holiday – like Turkey Day! And if you’re anything like me, you’re still trying to figure out what to make for Thursday. But worry not peeps, here are some great ideas if you’re stumped. First off… Cocktails of course! 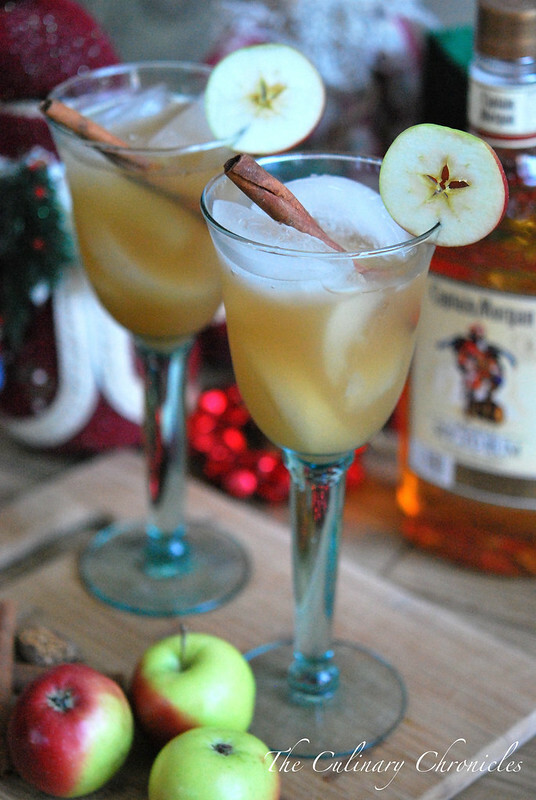 It’s made of apple cider, spiced rum, nutmeg and all other types of goodness that screams the holidays. And if your family/loved ones are anything like mine, you’ll need to keep the Appetizers flowing before the masses get h’angry. 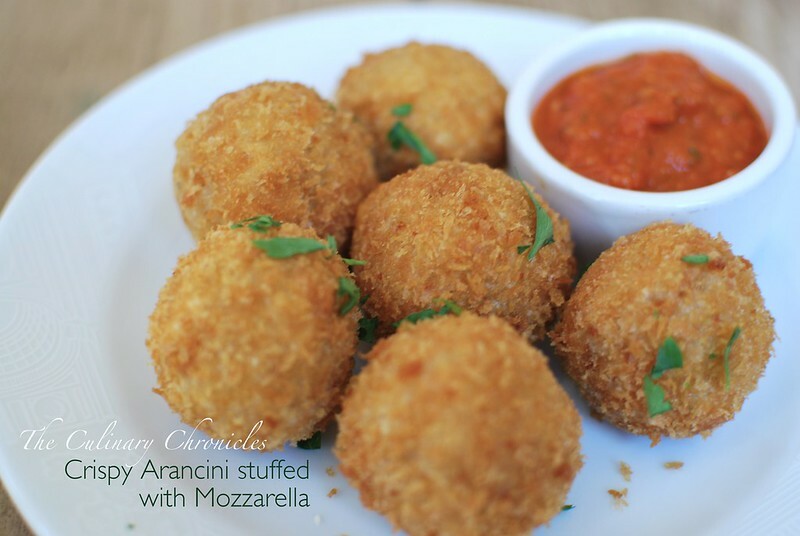 So for your safety, make a double batch of these fab Crispy Arancini Stuffed with Mozzarella. They can also be made in advance and frozen until you’re ready to fry them up. Next up… Bread time!!! Because in addition to potatoes, bread is my kryptonite. 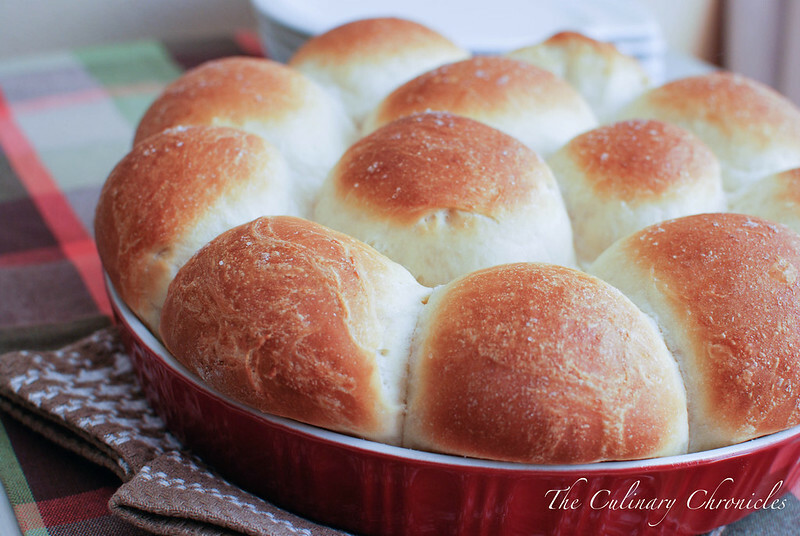 I’d recommend these Honey Yeast Rolls with Sea Salt. They’re fluffy, slightly sweet and if you happen to have a few leftover (which I doubt! ), they make the perfect buns for sliders. 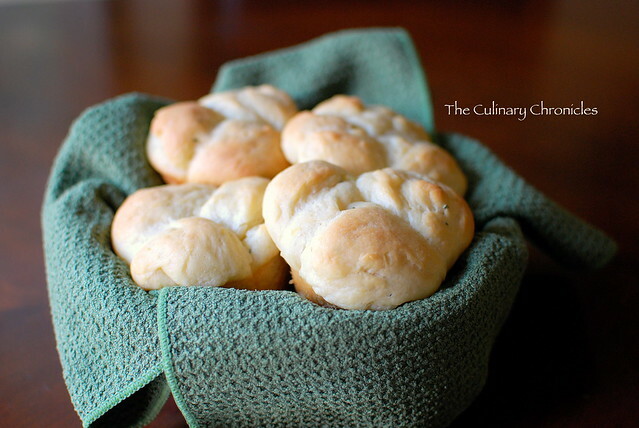 Another bread option would be Potato Rosemary Rolls which are the truth! Potatoes inside of bread?! Total no brainer. And trust me, your casa will smell like HEAVEN while they’re baking. How about a few Side Dishes? Now I realize there are some people who don’t fancy mashed potatoes. Nobody I would trust, mind you. 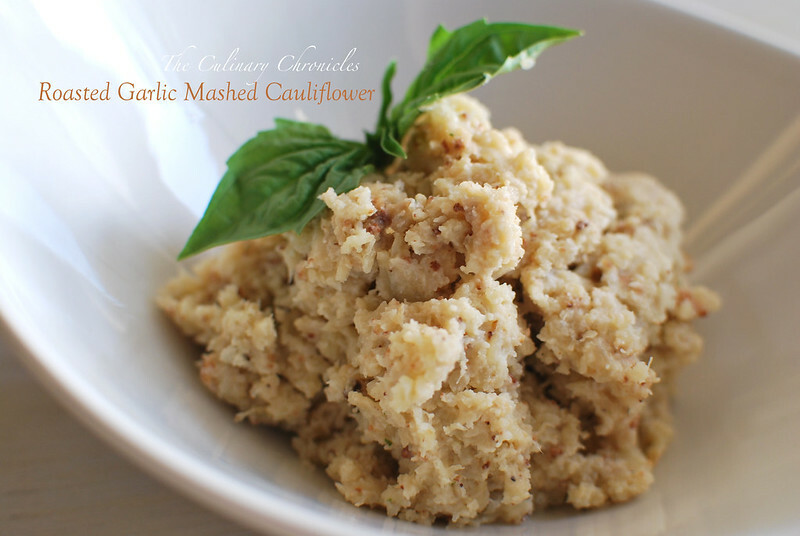 But for those folks (and for those who just like plenty of options), this Roasted Garlic Mashed Cauliflower will be a huge hit. 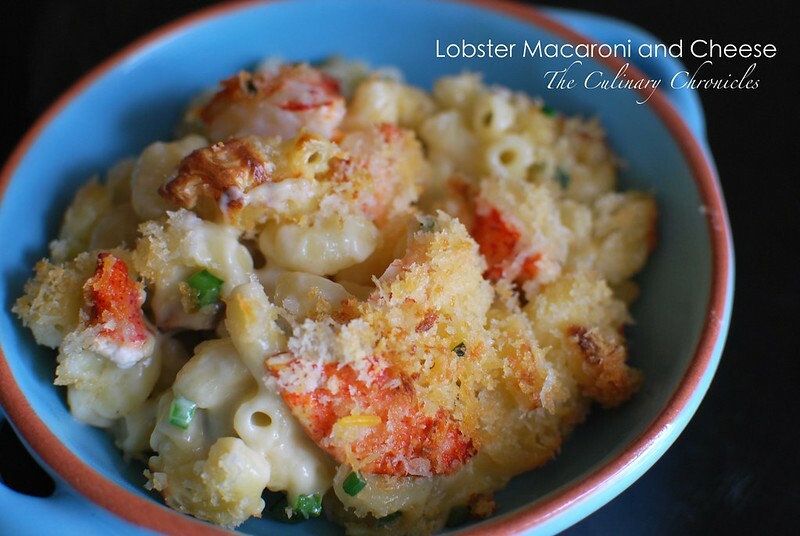 And just in case your Thanksgiving table wasn’t decadent enough, this Lobster Macaroni and Cheese not only kicks up a classic but it’ll have your guests giving thanks to YOU! At some point, you may want some greens. You know, because greens are good for you. 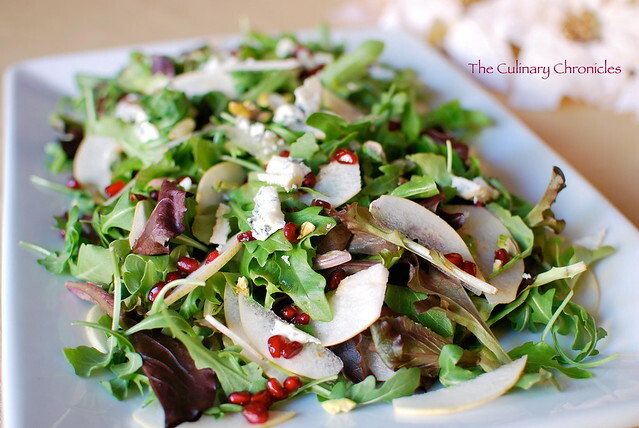 And this Asian Pear and Gorgonzola Salad with Pomegranate Vinaigrette is not only good for you but will be gobbled up in heartbeat. And now on to the Poultry. I totally get it. Fixing up an entire turkey can be a bit intimidating. But that’s no reason to totally nix a bird. 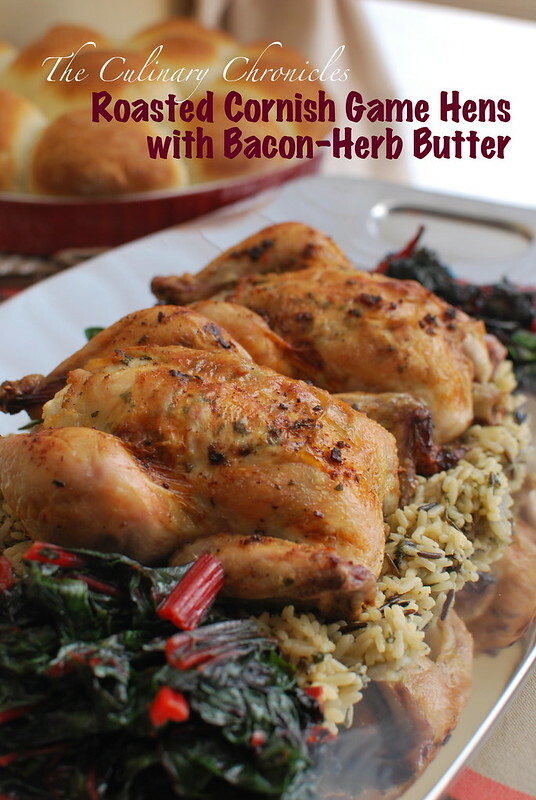 These little Roasted Cornish Game Hens with Bacon-Herb Butter are a perfect alternative. 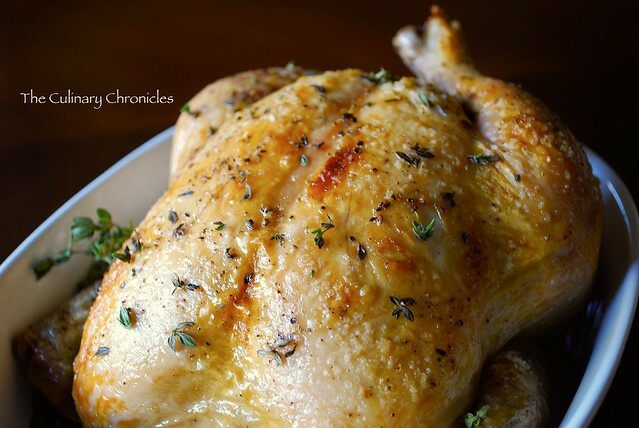 Game hens cut your roasting time down to about an hour and the meat is wonderfully succulent and juicy. Did I mention there’s bacon in it? Or you could keep things really simple and opt for a traditional Roast Chicken. Because really, a beautiful roast chicken is bliss. I almost always default to the grandmaster Thomas Keller’s method. Completely no fuss and I always get perfect results. Crispy skin, juicy meat. Sure there’s apple pie, pumpkin pie (BLEH!) and yadda, yadda, yadda. But how about something a little different? 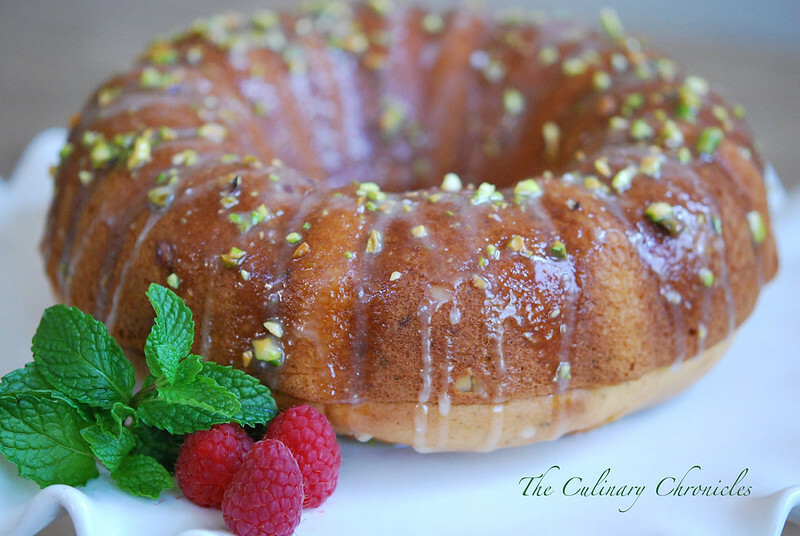 My Pistachio-Orange Blossom Cake would be a great finale to your Thanksgiving feast. The cake is light and gently perfumed with citrus. The crushed pistachio adds to the scent of the cake and it’s all topped with whipped cream and fresh berries. 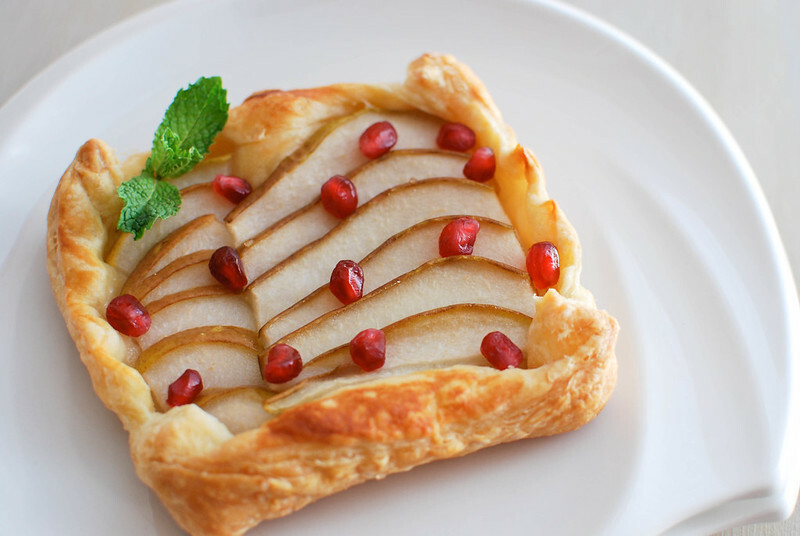 And because my family is never satisfied with just one dessert, these Pomegranate-Peart Tarts are just the ticket for a low fuss addition to the dessert buffet. Especially since you can cut corners by using pre-packaged puff pastry. Now, I’m officially starving…. But hopefully this gave you a few ideas to fill your menu for Turkey Day. And from my tummy to yours – I wish you and your loved ones a wonderfully delicious and comforting Thanksgiving! Depending on the size of your potatoes, cut them into halves or quarters so that they’re even sized. Place the potatoes in a large bowl and toss them with the melted butter, olive oil, rosemary, thyme, garlic and pepper flakes. Season them well with the kosher salt and black pepper. Once your oven has reached temperature, carefully take out your cast iron skillet (be careful, it’s hot!). Spread the potatoes into an even layer and place back into the oven. Roast the potatoes for about 30-40 minutes until they’re crisp on the outside and tender on the inside when pierced with a paring knife. 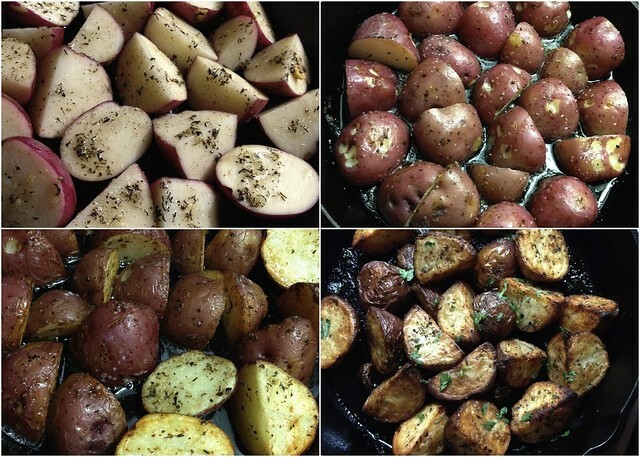 Be sure to flip the potatoes a few times during the roasting process to ensure even cooking. Once done, remove the skillet from the oven. 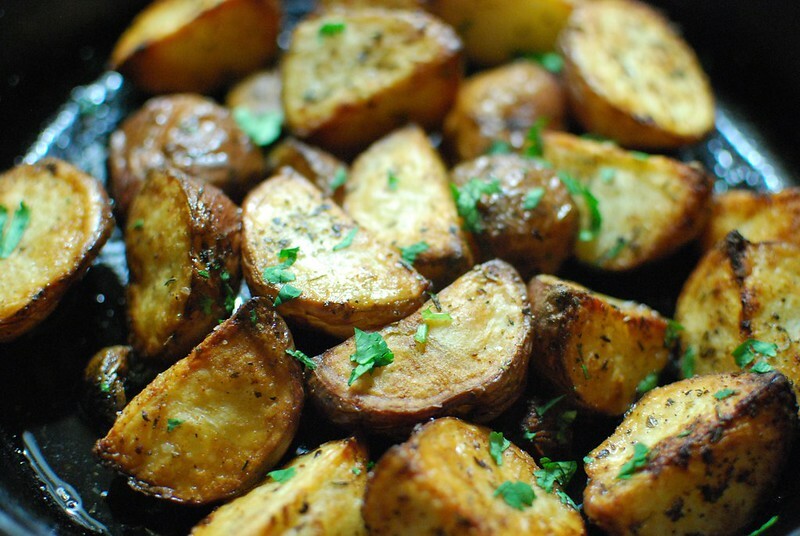 Toss the potatoes with the chopped parsley and squeeze fresh lemon over them. Enjoy! Previous Post We’re 5 Today!! Plus Bacon & Shrimp Cheesy Grits and a $100 AmEx® GiftCard GIVEAWAY! !